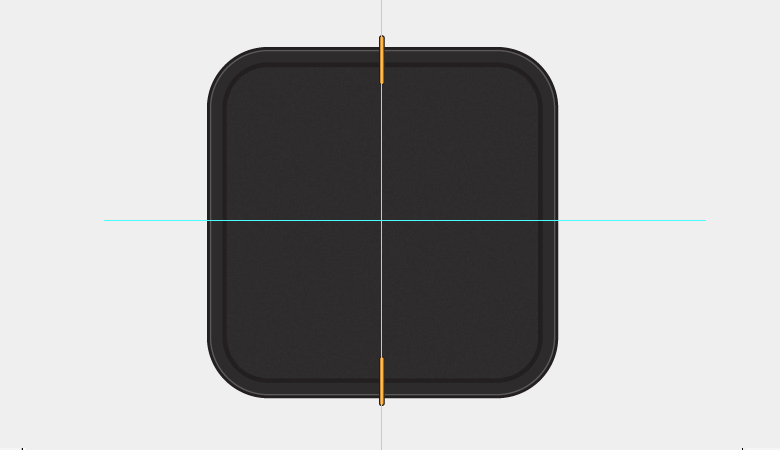 Icon design is deceptively difficult. Fitting salesmanship, intuition, and aesthetic appeal into such a small canvas can be quite a challenge, especially if you’re limited by technical constraints or brand guidelines. Skillful designers must go far beyond making their work “pretty”; they need it to communicate effectively and successfully signify the content or software that it symbolizes. 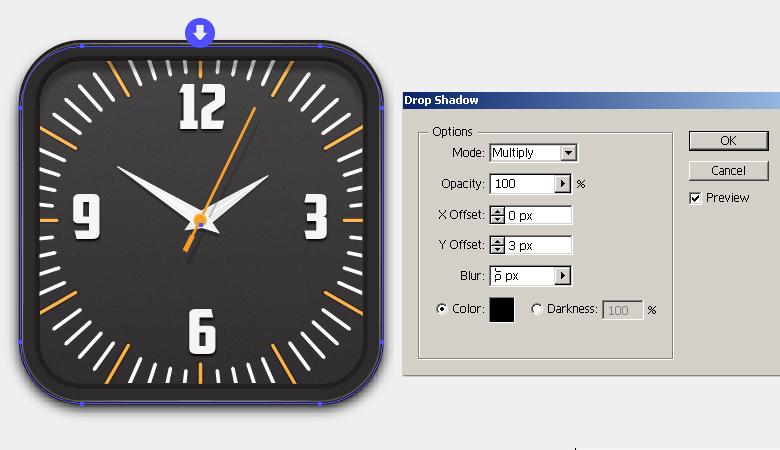 Today, I’ll walk you through the process of creating a wall clock vector in Illustrator. We’ll use various shape tools, the pen tool, the rotate tool and various options within the object and effect menus to achieve the final result. I hope you will learn few handy tips along the way. So, let’s get started! Create a new document in Illustrator with a 600px width and a 500px height. First, we’ll make the clock’s frame in two parts: outer, and inner. Let’s start with the outer frame. Pick #2D2B2C as your fill and #231F20 as your stroke color. 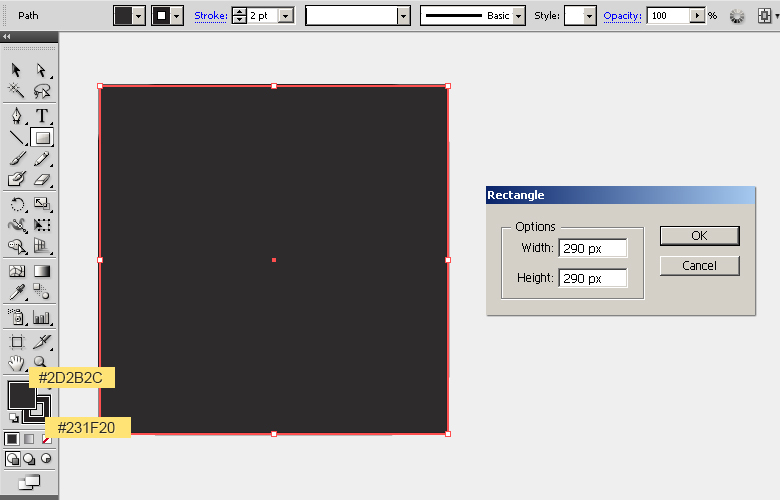 Now, select the rectangle tool (“M”) and click on the canvas to view the rectangle window. Enter 290px for both width and height, and press “Ok”. Label this as your “Outer Frame”. 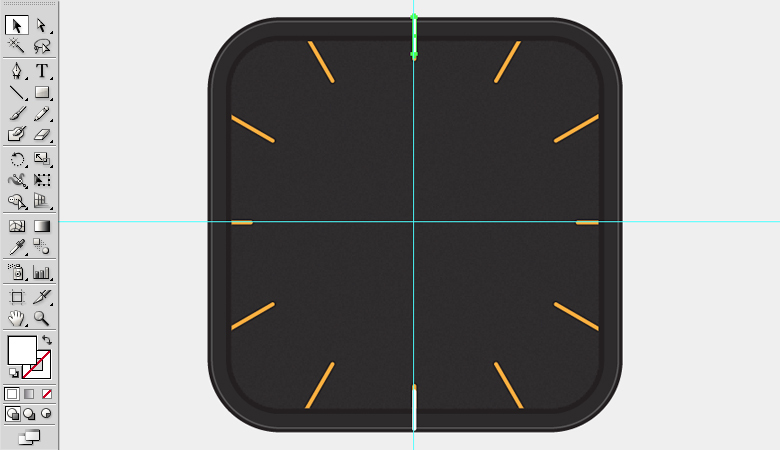 Select the rectangle by clicking the ring-shaped target present at right side of the respective layer and go to “Effect” > “Stylize” > “Round Corners”. 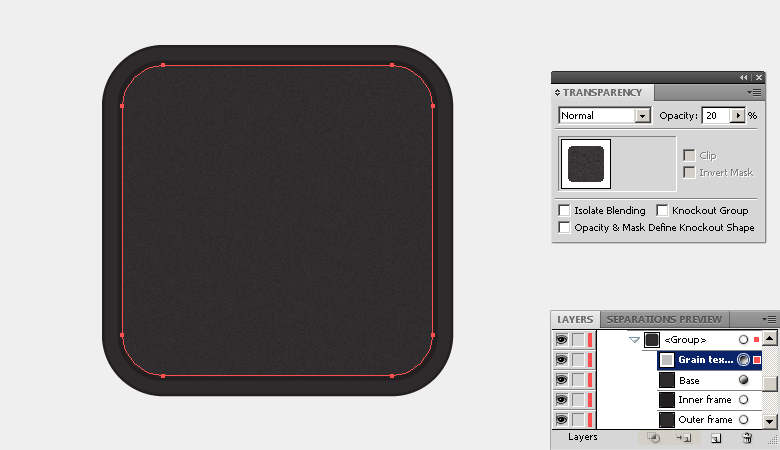 Enter a 50px value there to convert it into a rounded rectangle. 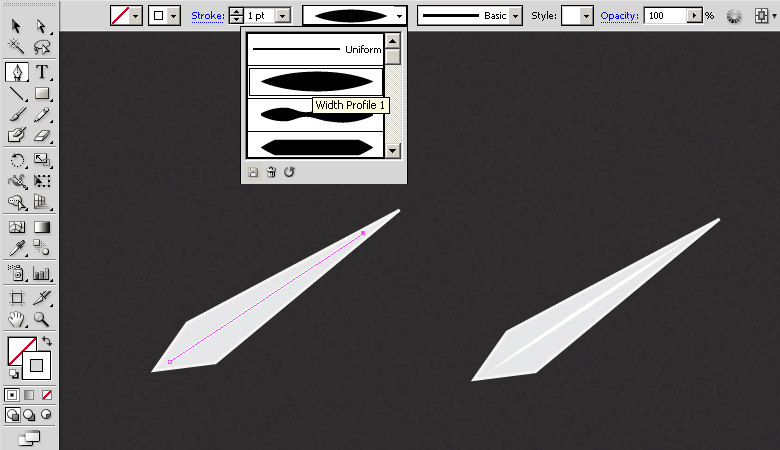 Now, go to “Object” > “Expand Appearance” to modify the shape. Next, select the outer frame and go to “Object” > “Path” > “Offset Path”. Offset the path by “-12px”. Now, select this new shape, change its fill color to #231F20 with no stroke, and label it as “Inner frame”. Select the inner frame and go to “Object” > “Path” > “Offset Path”. Offset the path by “-4px”. Now, select the new path, change its fill color to #2D2B2C with no stroke, and label it as “Base”. 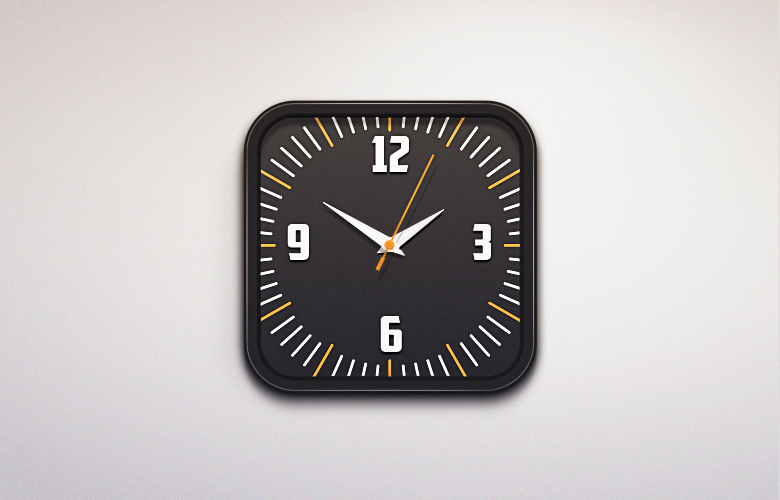 Next, we’ll apply a grainy texture to the clock. Select the base, press Ctrl + “C” to copy, it and press Ctrl + “F” to paste in front. 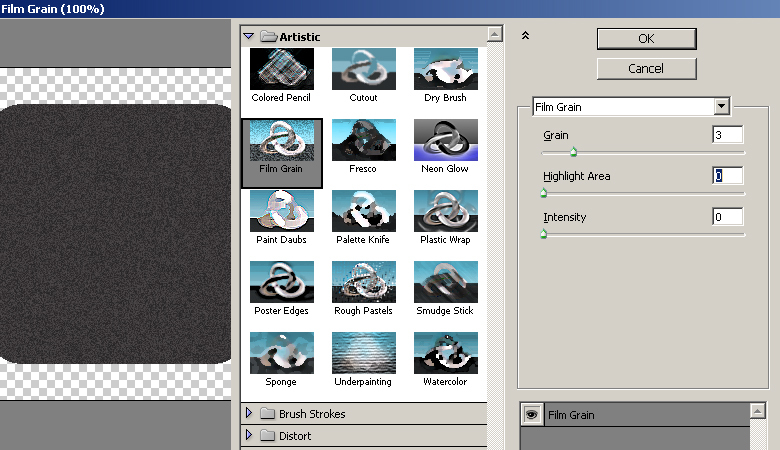 Now, go to “Effect” > “Artistic” > “Film Grain”. Apply the following settings here and hit “OK” to apply the grainy effect. 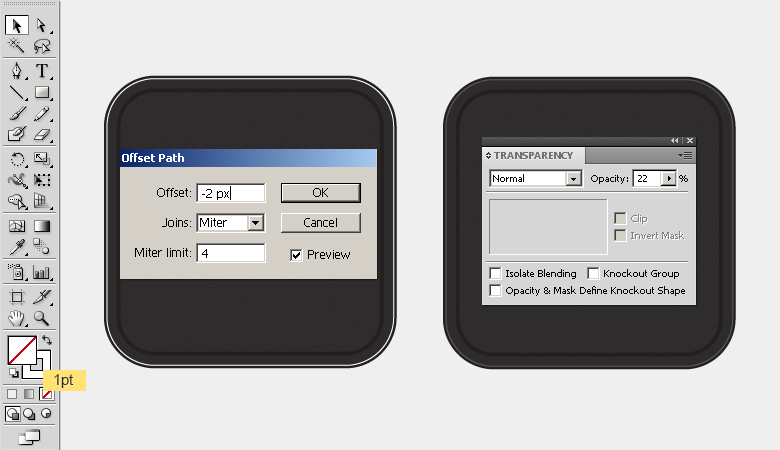 Reduce the texture opacity to 30% within the transparency panel (Shift + Ctrl + F10). To make a highlight over the frame, select your outer frame and go to “Object” > “Path” > “Offset Path”. Offset the path by “-2px”. Now, select this new path, set its fill color to “none,” and give it a white stroke (1pt). 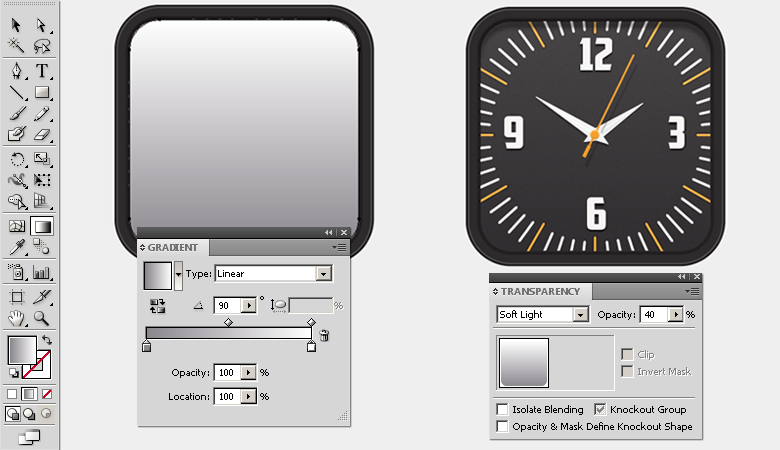 Adjust the opacity of the highlight to 22% within the transparency panel (Shift+ Ctrl+ F10). 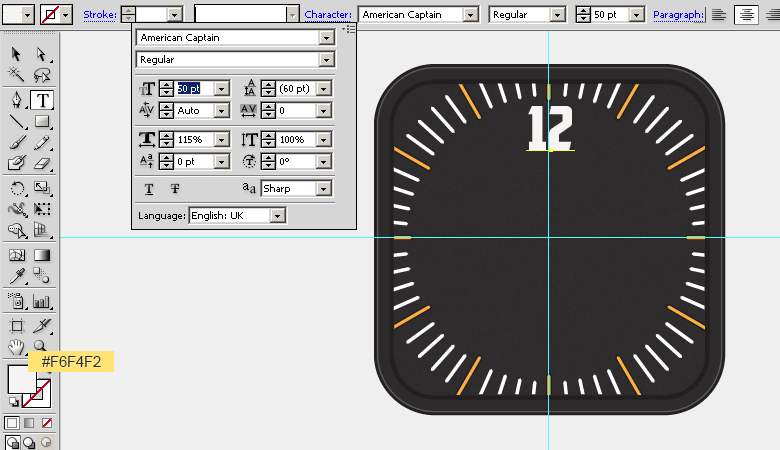 Next, we’ll make the markings over the clock. Position the guides for proper alignment. 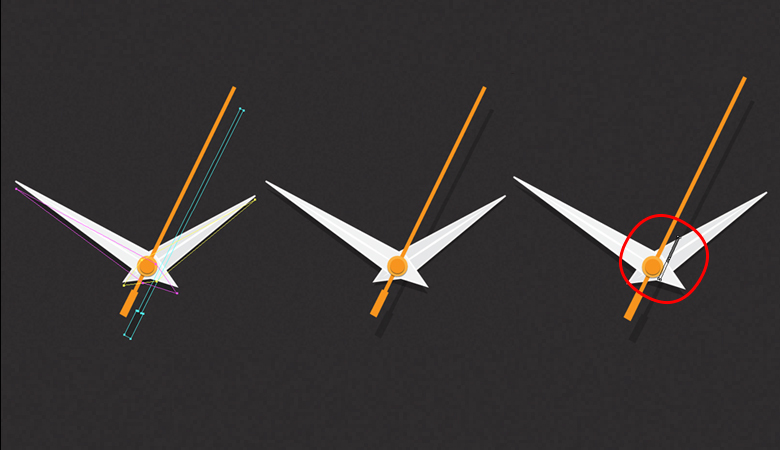 Press Ctrl + “R” to view the rulers, and drag vertical and horizontal guides to intersect at the center of your clock. 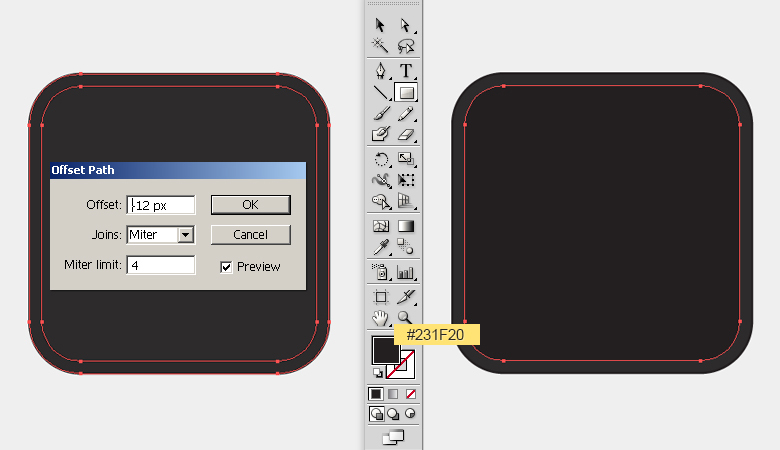 Now, draw a thin rectangle over the top edge to make hour markings using fill color #FBB040 and a black stroke (1pt). 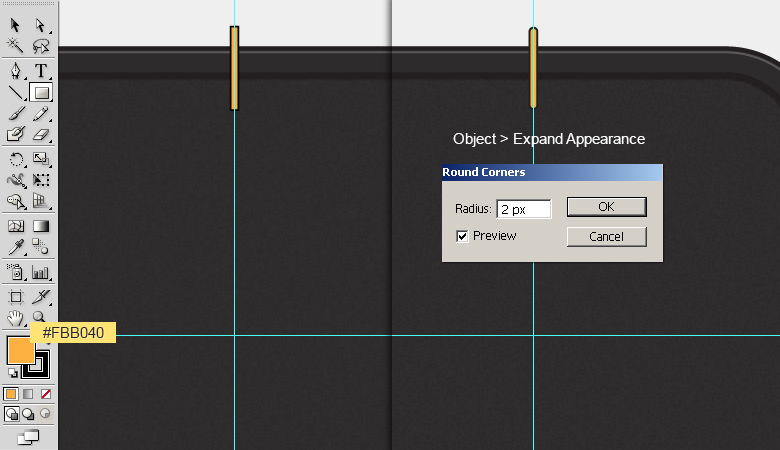 After that, select it and go to “Effect” > “Stylize” > “Round Corners”. 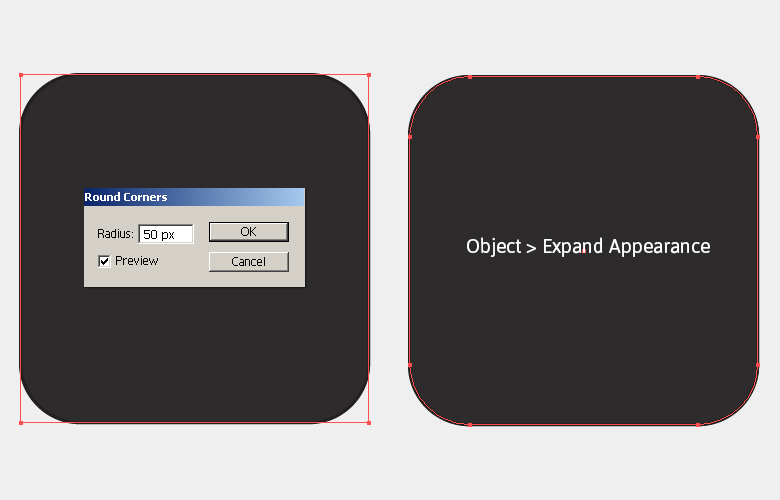 Enter 2px for your radius and go to “Object” > “Expand Appearance” to modify the shape. Select the rounded rectangle, press Ctrl + “C” to copy it and press Ctrl + “F” to paste in front. Now, place this copy over the lower edge of clock. 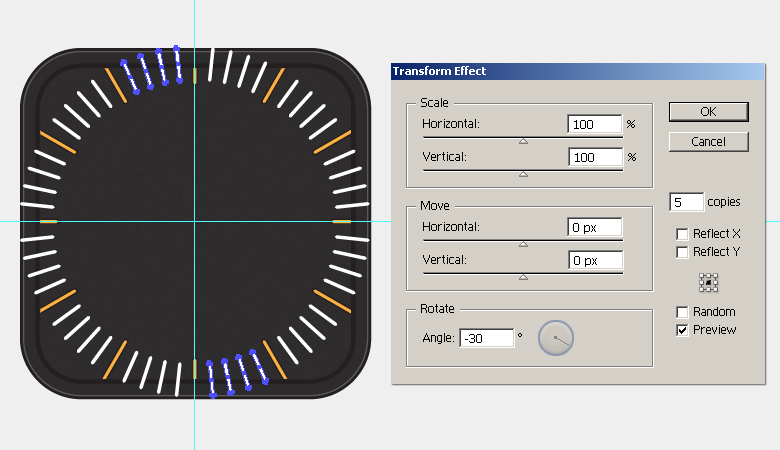 Select both of the markings and go to “Effect” > “Distort & Transform” > “Transform”. Apply the following settings here to make the rest of the markings. 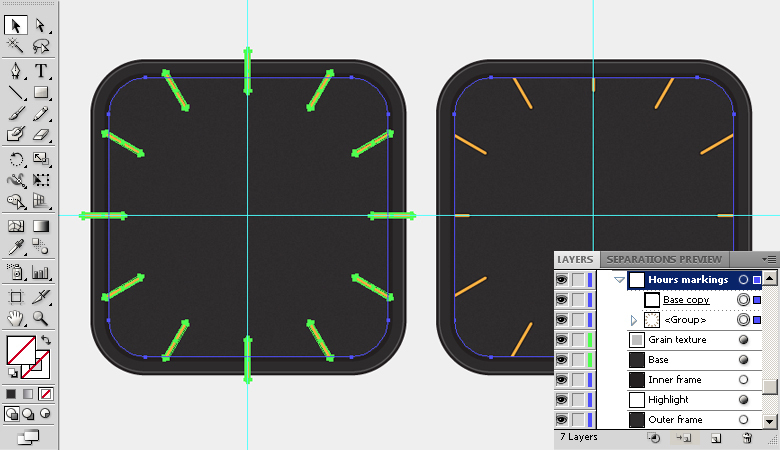 To confine the markings within the base, we’ll apply a clipping mask to them. However, we need to expand the markings first. Select them and go to “Object” > “Expand Appearance”. Now, make a copy of the “Base” layer, remove its fill and stroke, and place it above the markings layer. Now, select both the base copy and markings layer and go to “Object” > “Clipping Mask” > “Make”. Next, we’ll make minute markings. 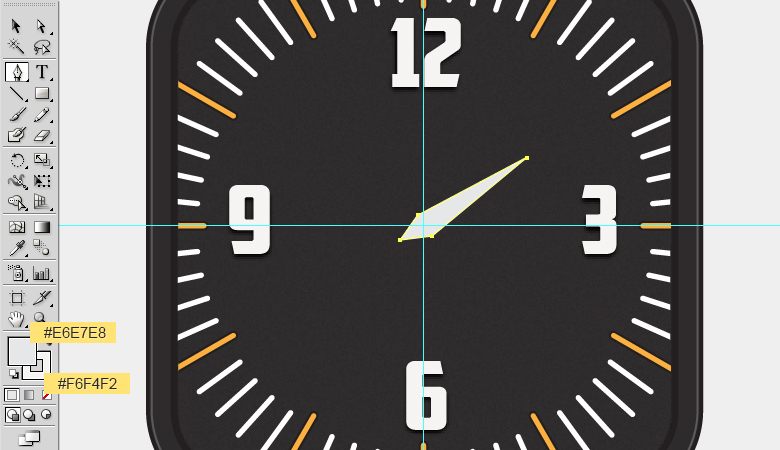 Draw a small rectangle over the top edge of the clock with a white fill color. 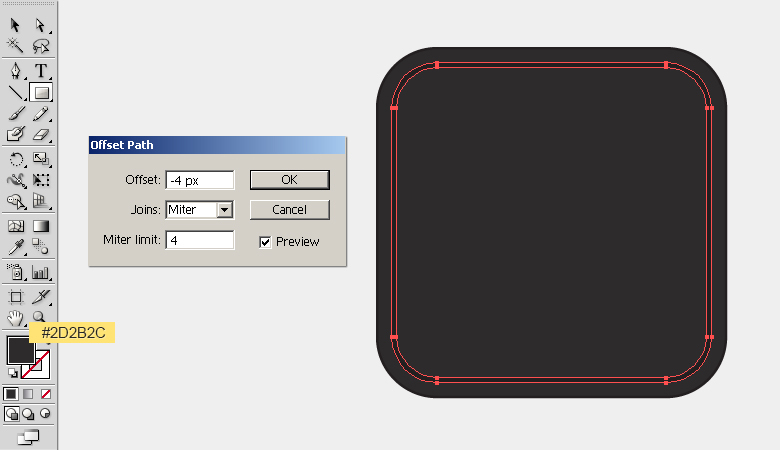 Convert it into a rounded rectangle with a 1.2px radius and expand it using the same pathway described in step 7. Now, make a copy and position it over the lower edge as shown below. 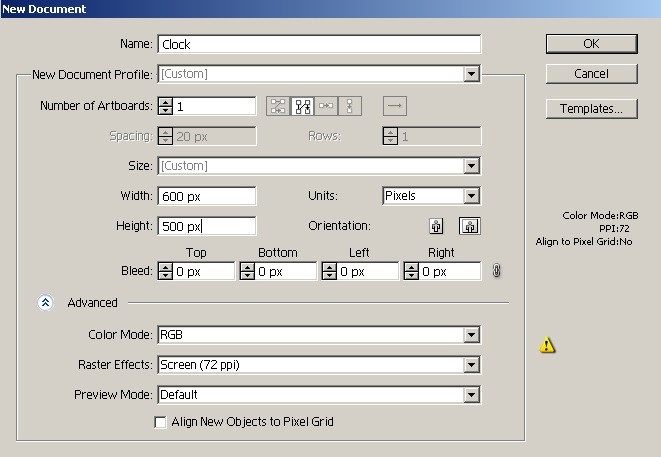 Select both rectangles, pick the rotate tool (“R”) and click the canvas to view the options window. Enter 6⁰ for your angle and hit “OK” to move the rectangles by 6⁰. Once again, select the rotate tool (“R”). This time enter a 6⁰ angle and click the “Copy” option. Now, press Ctrl + “D” twice to get two more copies. 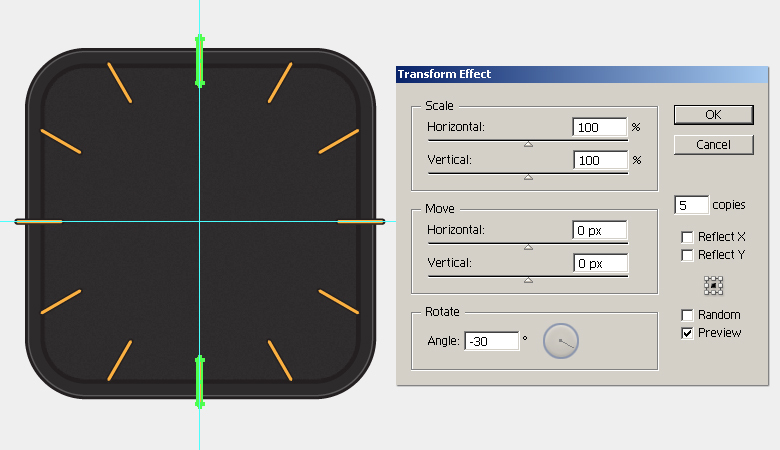 Select all of these rectangles and go to “Effect” > “Distort & Transform” > “Transform”. Apply the following settings here to make the rest of the markings. 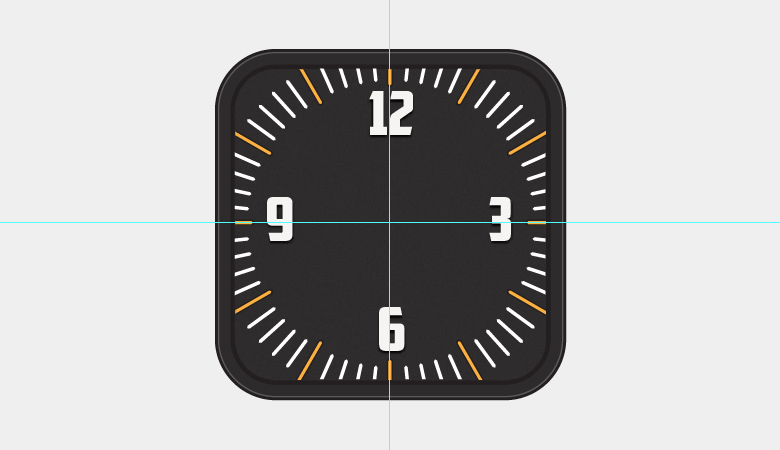 Now, confine the minute markings to the clock base by applying a clipping mask to them using the same technique used in step 9. Next, we’ll add numbers. Pick #F6F4F2 as your fill color and select the type tool (“T”) to type in the number “12” aligned along the vertical guide. I’ve used “American Captain” font with a 50pt size. 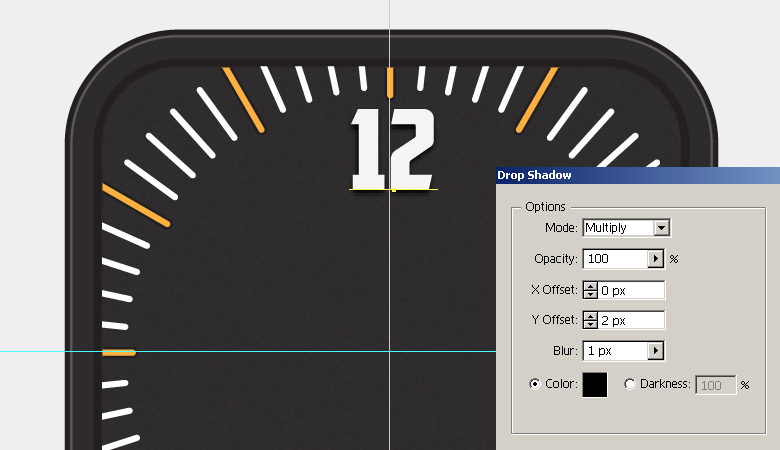 Type in the rest of the numbers with the same drop shadow settings and align them along the guides. Now, we’ll make the clock’s hands. Pick #E6E7E8 as your fill color and #F6F4F2 for your stroke. Select the pen tool (“P”) to draw the shape shown below. Draw a line using the pen tool (“P”) on a new layer with a 1pt white stroke. 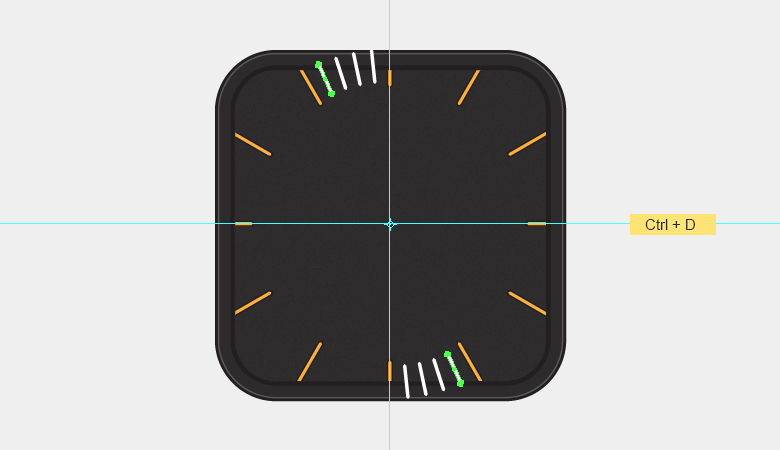 Change the width profile of the stroke to “width profile 1” in the control bar at the top of your interface. Make minute hand using the same technique. 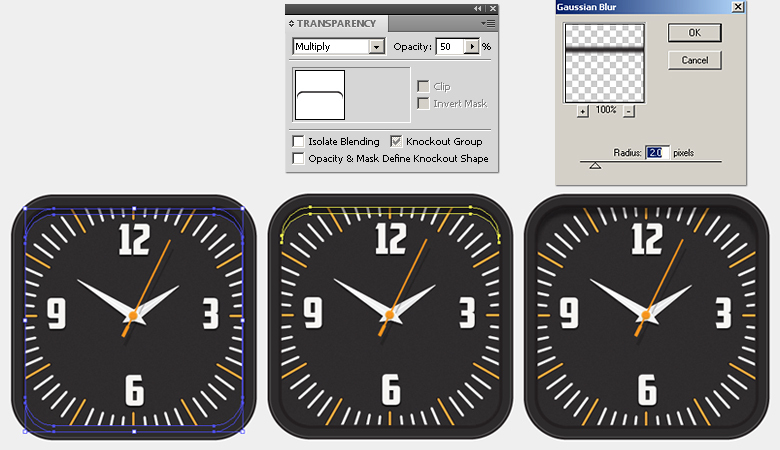 Now, make the seconds hand by combining two rectangles with fill color #F7941E position it as you like. 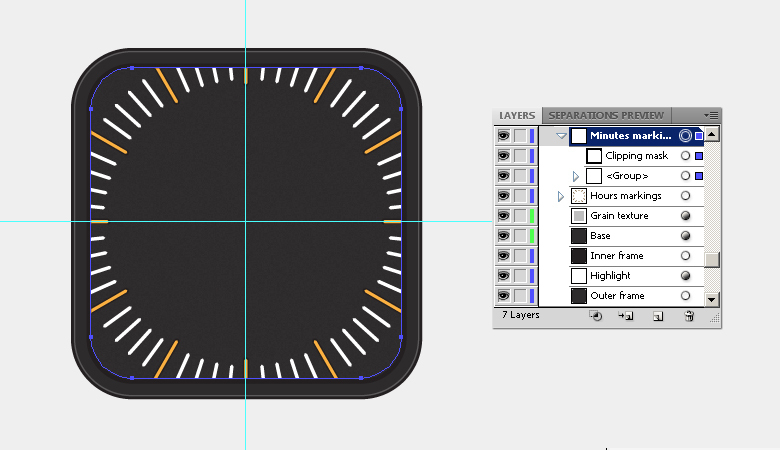 Next, add two circles over the hand: a larger ellipse using color #FBB040 and smaller one using color #F7941E. 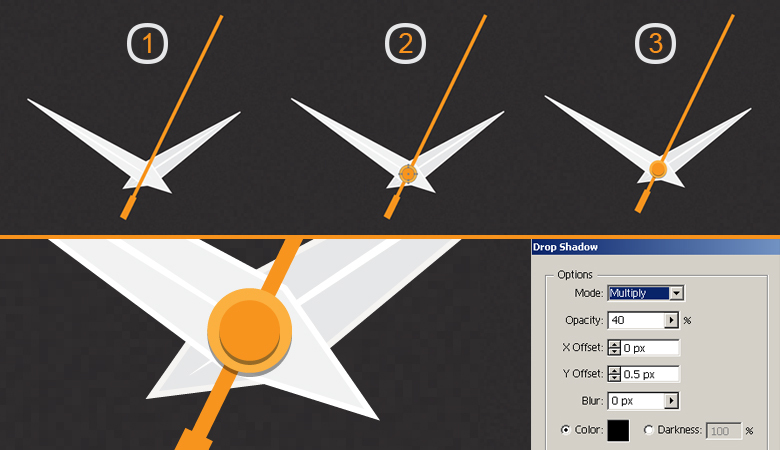 After that, apply the following settings for drop shadow on these ellipses one by one. Next, we’ll make hands’ shadow. 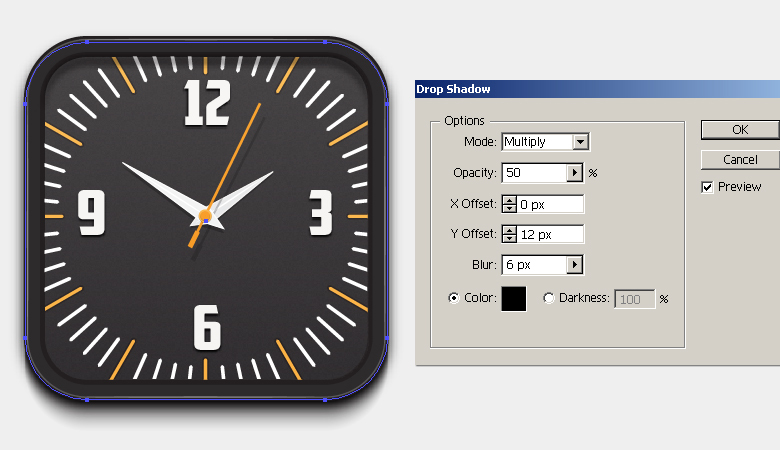 Select the hour hand, press Ctrl + “C” to copy it, and press Ctrl + “B” to paste it in place. Change the fill of this new copy to black, drag it 2-3 steps downwards, and decrease its opacity to 30-35% within the transparency panel. Make the shadow of the minute hand the same way, however, drag it 4-5 steps downwards, as it’s farther from the base compared to hour hand, necessitating a more distant shadow. Similarly, the shadow of the seconds hand should be even more downward, and you must place it below the rest of the layers. However, part of its shadow should be over the short needle, so draw a thin rectangle, rotate and position it as shown below. 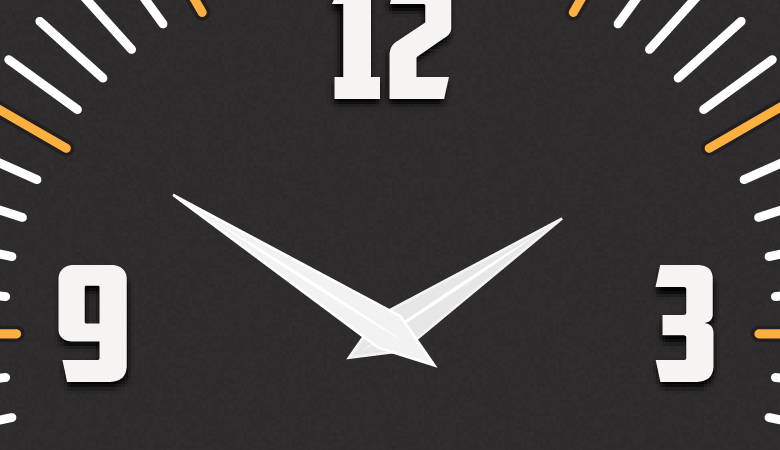 We’ll make the shadow under the top border of the clock. To achieve this, select the “Base” layer, press Ctrl + “C” and then press Ctrl + “F”. Make a copy of the layer. Now, drag the topmost copy 6-7 steps downwards. 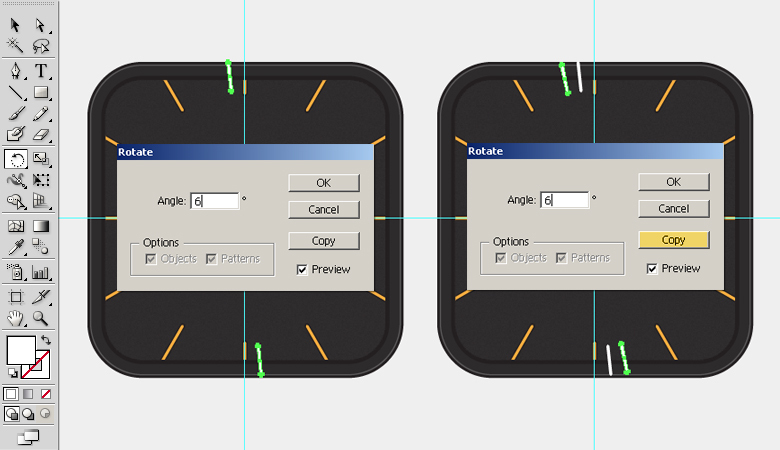 Select both copies and hit “Minus Front” within the pathfinder panel (Shift + Ctrl + F9). 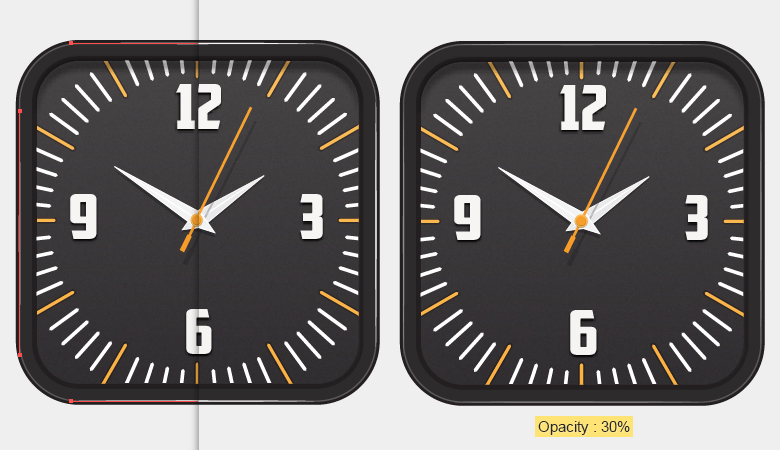 Change the blending mode of this new shape to “Multiply” with 50% opacity. Select it and go to “Effect” > “Blur” > “Gaussian Blur” and apply a 2px Gaussian blur effect to it. Make another copy of the “Base” layer and place it above the rest of the layers. Apply the following gray-to-white gradient on it using the gradient tool. Change its blending mode to “Soft Light” with a 40% opacity. Next, we’ll draw few highlights using the pen tool (“P”) with a white 1pt stroke and width profile 1 — the same method we used for the clock hands in step15. That’s it! Your click icon is complete. I hope you enjoyed the tutorial and learned something useful. Do share your thoughts!